Stock prices have been volatile since the credit crisis hit. The market hit multiyear lows in early 2009. The May "flash crash" showed that even the technology that allows markets to operate can be a danger to equity investments. Bonds have peaked in value, according to new research from Goldman Sachs Group (GS). And while U.S. real estate values have begun to recover in some regions, in others they are still falling. So the rich -- that is, the very rich -- have begun to hedge what they see as a dangerous financial world by buying gold. And, in some cases they've begun to stock up the precious metal literally by the ton. Reports from the Reuters Global Private Banking Summit show that several banks, led by Swiss giant UBS (UBS), have begun to suggest that their wealthiest individual investor clients to put as much as 10% of their assets into gold. 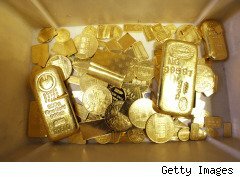 One banker said that a super-rich couple bought a ton of gold -- worth more than $42 million at today's prices -- and moved it to a country where they don't live. Other clients are buying gold by the bar. One banker told Reuters that concerns about inflation and global economic instability have pushed the rich to seek hard assets. The most dangerous aspect of this gold fever for the buyers is probably that a number of experts don't expect the value of the metal to go much higher. However, actions by central banks -- such as Tuesday's move by the Bank of Japan to cut its benchmark rate to near zero -- may lift the value of gold still further. As central banks in the EU, Japan and the United States change monetary policy, the value of currency could drop, and extremely low interest rates could eventually cause runaway inflation. Still, the price of gold has risen from a 52-week low of $1,026 to a recent all-time high of $1,329. That is a tremendous run, which raises the logical question of how long it can last. But for now, the richest of the rich appear to be banking on it continuing.